We are collaborating with the Southern Foodways Alliance (SFA) to bring the first in a series of SFA Field Trips to our O.Henry Hotel in Greensboro the weekend of July 13 – 15. The event called A Taste of the Carolina Piedmont celebrates and promotes the products and foodways of one of the most prolific and delightful food regions of the South. We are excited about our partnership with the Southern Foodways Alliance (SFA), an organization that celebrates, teaches, preserves and promotes the diverse food cultures of the American South. The SFA sees food as vital in itself and as a clear, accessible lens through which infinite aspects of Southern culture may be viewed and embraced. We’d like to tell you more about SFA so we’ve enclosed a membership brochure. Among the event presenters will be peach farmer and author Dori Sanders of Clover, South Carolina; novelist and musician Clyde Edgerton of Raleigh, North Carolina; sage, writer and raconteur John Egerton of Nashville, Tennessee; and food writer and author Jeanne Voltz of Pittsboro, North Carolina. Viewing the gardens at Old Salem with Director of Horticulture, Keyes Williamson, and sampling hearth cookery from their kitchens. Visiting the Old Mill of Guilford to learn about grits; touring Handance Farms to come to a better understanding of organic farming; and visiting Farmhouse herbs for a discussion of herb growing. Touring the Goat Lady Dairy and discussing farmstead cheesemaking and permaculture gardening with Ginnie and Steve Tate, then tasting their award-winning cheeses. Also included in the weekend are a Farmer’s Market trip to the Greensboro Curb Market; a Red Oak Brewery Boiled Peanut Party; a Taste of the Piedmont Chef’s Dinner featuring dishes prepared by talented chefs from across the Piedmont; an evening of reading, storytelling, good natured bantering and a little music, all centered around Southern food in Southern literature; cooking classes; readings and book signings by our guest authors; and plenty of good eatin’. The Southern Foodways Alliance Field Trip costs $225 for SFA members and $250 for non-members. Hotel accommodations at the O.Henry Hotel are available for participants at a reduced rate of $124. For information about the SFA Field Trip or to make reservations call Sara Sherman at 336-370-0966 or 800-965-8529. Sure as fire, this event will sell out quickly, so make your reservations early. For information about the Southern Foodways Alliance contact SFA director John T. Edge at 662-915-5993 or visit the website at southernfoodways.com. The inclusion of Chef Billy Seay’s culinary sensibility and personality. Our chef, Billy Seay, has already begun trying out some of his great ideas. If you have been enjoying our recently introduced rotisserie prime rib, or the succulent pan-seared sea bass, you can thank Billy. Simplified preparation. We’re cooking with the highest quality, freshest ingredients and letting the food speak for itself. More locally grown and produced ingredients. We’ve said it before and we’ll say it again: there’s just something inherently right about the notion of buying food from good neighbors to prepare and serve to good neighbors. We’ll bet you’ll like the evolution. 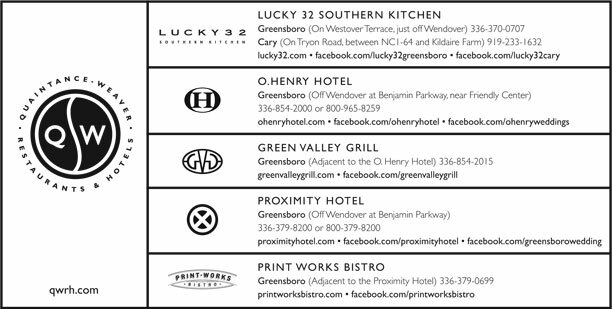 For reservations or call-ahead seating call the Green Valley Grill, adjacent to the O.Henry Hotel, at 336-854-2015.